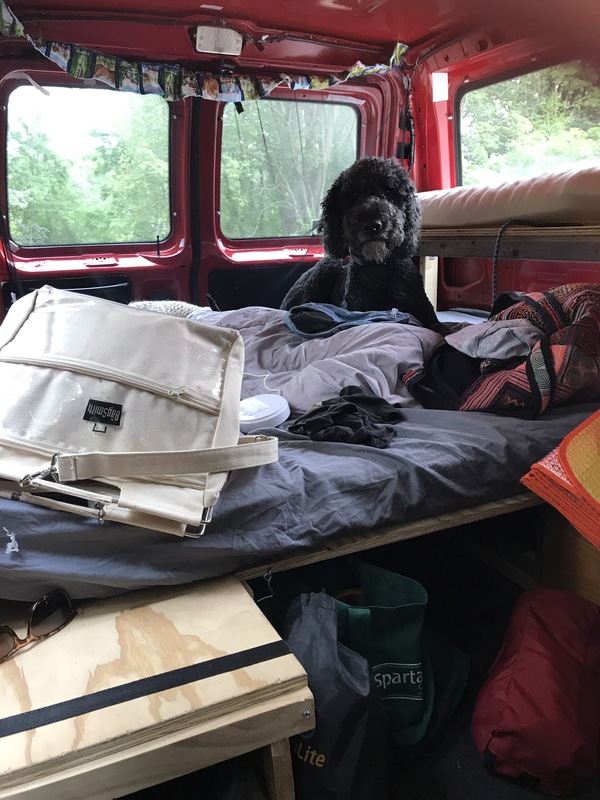 We completed a very basic build in our van. Sleeping 4 in a full size van doesn’t leave lots of space for extras, but we are able to comfortably sleep and come and go with minimal set up. 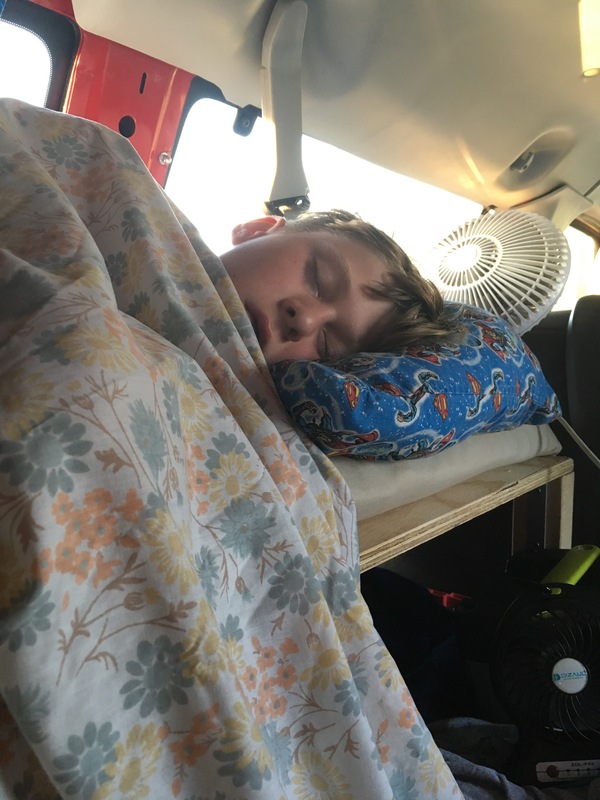 My husband and I sleep on the fold out bed in the back, our eldest sleeps on the loft above our feet and our youngest fits on the bench seat. As he grows we will have to figure out another option, but it works for now. Our first big trip with the van was a 15 hour drive to Kure Beach. 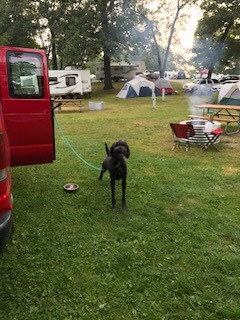 We slept at a Loves truck stop, two campgrounds and a Walmart parking lot on our way to the beach, stopping in West Virginia for rafting on the New River and mountian biking on the Arrowhead trails. 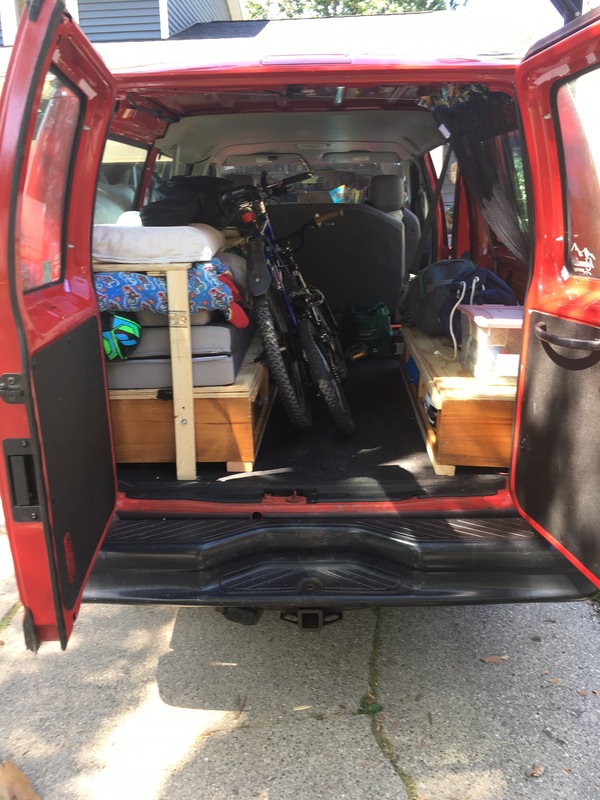 We hauled 4 bikes for this trip – two on a hitch rack and two in the back of the van. This required us to fold the bed up and down so we could slide the bikes in the back each time we traveled to a new location. Much easier than camping and cheaper than a hotel, but loading the bikes in and out was a bit of a hassle. It wouldn’t be a family vacation if we didn’t have some sort of SNAFU. In West Virginia my husband backed the van into a tree with our two bike hitch rack on the back. He spent some time futzing with it and we headed down the road. As we were driving to a trailhead we noticed people waiving and yelling at us…my husbands bike was secured to the rack by the tire straps and his handlebars were dragging on the road behind us. His bike was repaired at the LBS and he fussed with the rack before we headed out to the trail. Long story short, as we arrived at the trailhead and went to get the bikes off the rack, my husbands bike was not there. A car arrived at the trailhead shortly after we noticed our loss and told us they found it in the road about a mile back. My husband ran back to get it. I immediately started pricing 4 bike hitch racks and they are expensive. We decided that we needed to wait to get one and found a way to secure the bikes for remainder of the trip and thankfully avoided anymore bike excitement. The seed was certianly planted- we need a new rack. We decided on a 4 person tray rack and opted for the SARIS Freedom SuperClamp 4. We pulled the trigger in August when we needed to get 4 bikes to a town about an hour away from our home. The rack is very secure and simplifies our coming and going with the van. With the bikes on the back, we get out of our beds, climb to our seats and drive away.